The Amazing Technicolour Pyjama Therapy by Emily Ackerman was reccommended to me by someone else who suffers from chronic illness. It is unusual to find a book that comes at ‘living with’ from a faith perspective, so I thought I would give it a go. This post will review it, at some point I may write reflecting on what it says to me where I am. Emily writes this book from her own perspective and experience of being a doctor before illness put an end to her professional career, so she writes with true understanding. It is based, if you hadn’t guessed from the title (and I hadn’t – that’s how much brain fog I have!) around the story of Joseph – he of the Technicolour Dreamcoat fame, and the losses he had to face in his life. There are chapters about a wide range of issues involved in facing life-changing issues. Chapters range from working out how to get the rest that you need, family issues, work, church and faith, and a final one on facing terminal illness. At all points practical, emotional and spiritual challenges are tackled. The sub-title is ‘And Other Ways to Fight Back Against Life-Changing Illness’ and that is essentially what it is, a book to face the reality of where you are and perhaps find a (better) way to live with that. The book is written with a very jaunty appearance. An easy to read font, nice arty squiggles and some cartoons – which are very funny! Each chapter is broken down into manageable chunks if that is all you can manage. It is interspersed with helpful bible passages and at the end of each chapter there is a ‘For Reflection’ section, with questions to help you do just that. Each chapter then concludes with some witty and poignant quotes. 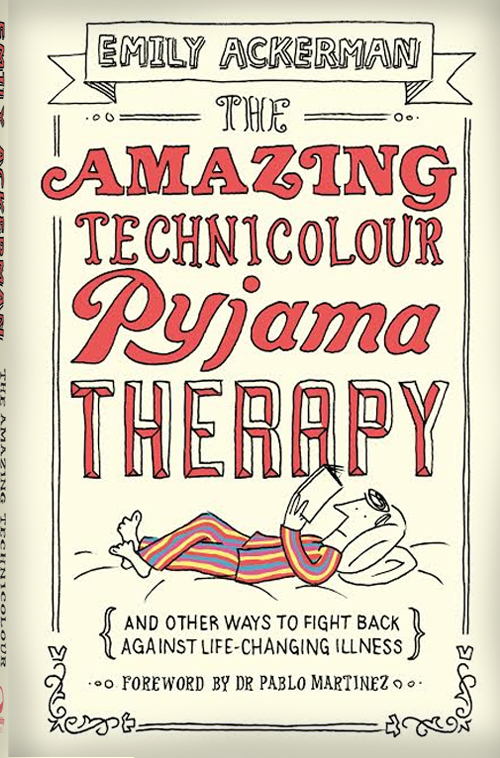 But for all it’s jolly appearance, The Amazing Technicolour Pyjama Therapy is not an ‘easy read’. Much of what it says is profound, and I had to keep stopping, sometimes for days, to let it sink in and work out what that meant for me. The Reflective questions were particularly helpful with this. This is not a book to jolly you along, or I didn’t find it so, but a book to make you really stop and think at where you are with your illness and it’s effect on your life. Much of this book was very helpful. However, I did find some of it a bit simplistic, for example regular comment is made on ‘choosing’ to think or behave differently. If only it were that simple, I wouldn’t need to be reading this book! Perhaps that’s something I need to work on… Or the comment that, “every believer will be useful in heaven” (p186), the kind of comment that I find really unhelpful, but it may be just what someone else needs to know. I was also slightly disturbed by Chapter 11 on Healing, where I read a suggestion that sin can be the cause of our illness, or illness used as a discipline. This is certainly not my theology. However, it is always good for a book to have parts that bring you up short and think, ‘do I believe that?’ ‘What do I believe?’ And I was delighted to discover someone with the same analogy as mine of Sweeping Things Under the Carpet! Thank you Emily for writing it. Sounds like a really intriguing book to read and review. Thank you for sharing!